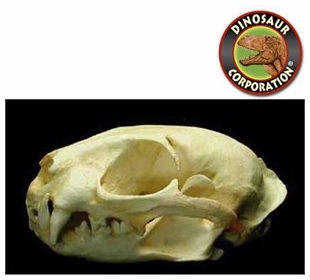 Leopard Cat skull replica is cast from original specimen. Felis bengalensis. Male Skull. The leopard cat (Prionailurus bengalensis) is a small wild cat of South and East Asia. Since 2002 it has been listed as Least Concern by IUCN as it is widely distributed but threatened by habitat loss and hunting in parts of its range. There are twelve leopard cat subspecies, which differ widely in appearance. In the tropics, leopard cats weigh 0.55 to 3.8 kg (1.2 to 8.4 lb), have head-body lengths of 38.8 to 66 cm (15.3 to 26.0 in), with long 17.2 to 31 cm (6.8 to 12.2 in) tails. In northern China and Siberia, they weigh up to 7.1 kg (16 lb), and have head-body lengths of up to 75 cm (30 in); generally, they put on weight before winter and become thinner until spring. Shoulder height is about 41 cm (16 in).